Looking for a home that has potential for an in-home business? This Fantastic Cape has a generous amount of space throughout. First flr features spacious kitchen w/ breakfast bar opening to sun drenched dining rm w/ brick hearth fireplace & gleaming hdwd flrs, spacious living rm w/ built in's & hdwd flrs, laundry rm w/ half bth and two additional bdrms w/ hdwd and full bath. Located just off the kitchen, a lovely four season sun rm awaits you w/ skylights,carpet and heat.. wow! Second flr features two massive bdrms and a full bth. Outdoor enjoyment starts here on this 3/4 acre lot offering privacy galore! Seller states upgrades include electrical, replacement windows, interior freshly painted throughout, roof is approx 10 yrs & chimney is rebuilt. The lower level has it's own separate entrance, family rm w/ fireplace and home office, offering additional 600+ sq ft. Just the perfect opportunity for an in-home business w/ extra parking... Bonus - Town water & sewer. Come See, Come Buy! 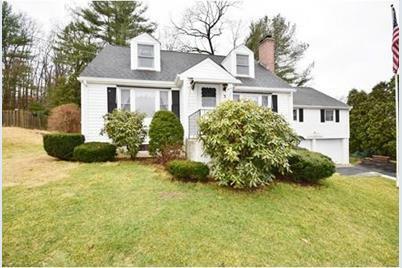 3 Brainard Rd, Wilbraham, MA 01095 (MLS# 71972789) is a Single Family property that was sold at $253,000 on August 12, 2016. Want to learn more about 3 Brainard Rd? Do you have questions about finding other Single Family real estate for sale in Wilbraham? You can browse all Wilbraham real estate or contact a Coldwell Banker agent to request more information.